Arianespace has conducted its fifth Ariane 5 mission of the year with the launch of two telecommunication satellites. 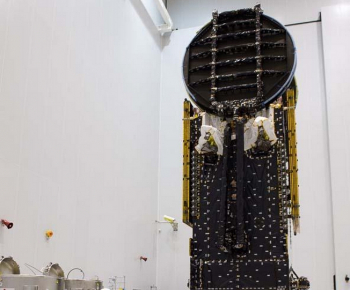 Sky Muster (NBN Co 1A) and ARSAT-2 rode uphill on the European workhorse, with the launch taking place on schedule at 20:30 UTC from the European Spaceport in Kourou on Wednesday. The Ariane 5 ECA (Cryogenic Evolution type A) – the most powerful version in the Ariane 5 range of rockets – was employed once again for this flight, a vehicle that is an improved version of the generic Ariane 5 launcher. Those improvements relate mainly to the structure of the Ariane 5, allowing for an increased thrust and ability to carry heavier payloads into orbit. Designed to place payloads weighing up to 9.6 tonnes into GTO, this increased capacity allows the Ariane 5 ECA to handle dual launches of very large satellites. Given Arianespace now enjoys a full family of launch vehicles. With the introduction of Soyuz at the Spaceport in 2011, Arianespace’s family was joined by the lightweight Vega vehicle, following her successful debut in 2012. Arianespace will also be at the center of a new launch vehicle, the Ariane 6, which has been approved by the ESA members. This latest mission was designated Flight VA226 in Arianespace’s launcher family numbering system and was the 226th Ariane mission since this series of vehicles entered operation in 1979. Its total lift performance was more than 10,200 kg., which includes approximately 6,440 kg. for Sky Muster, the estimated 2,977 kg. mass of ARSAT-2, and the hardware for Ariane 5’s SYLDA dispenser system that accommodates the dual payload. Released first during the mission – due to riding in the upper passenger position of Ariane 5’s dual-payload arrangement – was Sky Muster. This spacecraft will deliver broadband services to more than 200,000 rural and remote Australians. It was the initial satellite to be orbited by Arianespace for nbnTM, a Commonwealth of the Australia-owned company. Also known as NBN Co 1A, the satellite has a mass of nearly 6,400 kg, It was built by Space Systems Loral. ARSAT-2 rode in the lower payload position on Ariane 5. 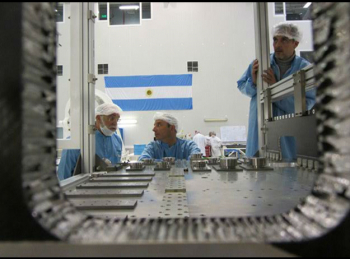 This satellite was built under the responsibility Argentina’s INVAP and will be operated by the state-owned Argentinian operator ARSAT to provide direct-to-home television (DTH), Internet access services for reception on VSAT antennas, along with data transmission and IP telephony. It has a liftoff mass of approximately 2,975 kg. 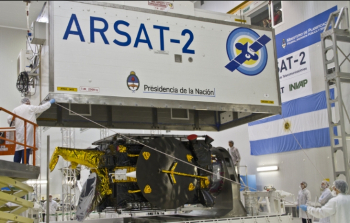 ARSAT-2 is the second geostationary satellite designed and manufactured in Argentina (and all of Latin America). ARSAT-2 is the younger twin of ARSAT-1 and is based on the ARSAT-3K bus. ARSAT-2’s communication equipment consists of 16 Ku-Band transponders and 4 C-Band transponders. It has two deployable and one fixed Gregorian antenna. It will cover all the Americas offering data services as well as television content distribution. This is a strategic asset since Argentina is the leader on broadcast content production for Latin America and ARSAT-2 will enable it to distribute it directly through all the continent. While the payload was supplied as a whole subsystem by Thales Alenia, the integration even to the physical mating and integration with the bus, was done entirely by INVAP with the contractor just overseeing the procedure. The mission was the ninth of 12 flights planned this year by Arianespace utilizing its family of the heavy-lift Ariane 5, medium-lift Soyuz and lightweight Vega. 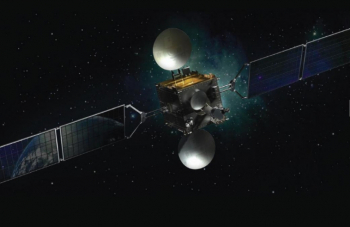 Meanwhile, Arianespace announced on Wednesday that it has signed a contract ARSAT to launch its next geostationary satellite, ARSAT-3, plus options on two more launches. This strategic long-term agreement follows last year’s successful launch of ARSAT-1 on October 16, 2014, and came a few hours before the launch of ARSAT-2. It will cover Argentina’s satellite launch requirements until 2023. With a liftoff mass of approximately 3,000 kg., ARSAT-3 will be the first satellite launched, delivered to geostationary transfer orbit in 2019. It will be injected by an Ariane 5 from the Guiana Space Center, Europe’s Spaceport in French Guiana. The two options involve two geostationary satellites that are similar to ARSAT-3, and for which their launches are planned for the 2020-2023 timeframe. These new ARSAT satellites will complement the services already offered by ARSAT-1 and soon ARSAT-2.